The core team of the company relating to its field of activity is the successor of the Design and Implementation of Professional Wireless Telecommunication Networks Project started at the professional predecessors as TKI Research Institute for Telecommunication and TKI Innovation Company for Telecommunication continued at TKI-Network Kft. The company has choosen the name T-Network Kft. from year 2000. The company is limited company fully owned by private persons. T-Network Kft. offers its customers with services such as implementation of wireless networks, logistics, repair center for the ELTEK power supplies (e.g. the ones used in the tactical radios) turnkey EMC chambers and shielded rooms and facilities, device-development, laboratory production, device-production (and as a separate activity the real-estate management services relating to the 5000 sqm own HQ in Budapest). 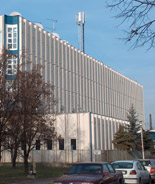 Regarding the company's products, T-Network sells uninterruptible power systems, metallized fabrics, produces and sells electromagnetic wave absorbers, inorganic radar absorber materials, special protection filters for the shielded facilities, environment protection absorber covers and walls, standing TEM pyramides (rolling enclosures suitable for radiated noise immunity tests in the frequency range 0-3GHz field strength range 7V/m (1W)...100V/m (200W)), shielded enclosures (with absorber lining for the testing of the mobile phones and radios), and custom tailored passive RF devices (like direction couplers, low pass tubular filters, diplexers). T-Network produces the 12 channel, 48 Mbps DSA-03 TDM demultiplexer, demodulator equipment developed and marketed by Tavkozlesi Innovacios Laboratorium Kft (a subsidiary of T-Network kft. ).